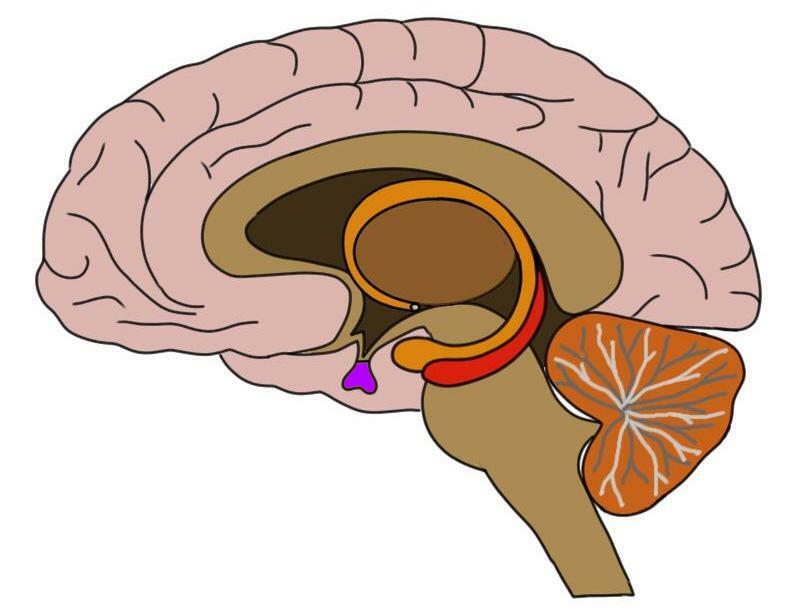 The pituitary gland is colored purple in this image. The pituitary gland is a small (about the size of a pea) endocrine gland that extends from the bottom of the hypothalamus. It is divided into two lobes in humans, the anterior pituitary and posterior pituitary. The anterior pituitary does not have direct neural connections to the hypothalamus, but is able to communicate with it through a system of blood vessels called the hypophyseal portal system. The posterior pituitary, however, is directly connected to the hypothalamus by a tube-like structure called the infundibular stalk. The pituitary gland is often referred to as the "master gland" of the body because it is responsible for the release of hormones that regulate the activity of other endocrine glands and bodily systems; in this way it affects physiological processes throughout the body. Despite its directorial appellation, however, the pituitary gland itself is controlled by the hypothalamus. The anterior pituitary is responsible for the synthesis and secretion of a collection of hormones that have manifold effects in a number of different physiological systems. Some of these hormones, along with a very simplified description of their actions, are: adrenocorticotropic hormone, which prompts the release of glucocorticoid hormones like cortisol; beta-endorphin, which is involved in natural pain relief; thyroid-stimulating hormone, which induces the secretion of metabolic hormones from the thyroid; follicle-stimulating hormone and luteinizing hormone, which are involved in the proper functioning of the reproductive system; growth hormone, which promotes growth; and prolactin, which is involved in milk production in females. Of course the roles of each of these hormones is actually much more diverse and complex than this list indicates, but these are some of their best-known functions. The hypothalamus does not have neural connections with the anterior pituitary but it communicates with the gland via a system of blood vessels called the hypophyseal portal system. The hypothalamus secretes hormones called releasing hormones into the hypophyseal portal system; these hormones travel through the bloodstream to the anterior pituitary, where they act as signals to prompt the release of hormones like those listed above. The posterior pituitary is responsible for the secretion of two hormones: oxytocin and vasopressin. Unlike the anterior pituitary, however, the posterior pituitary does not synthesize its own hormones. Oxytocin and vasopressin are both synthesized in the hypothalamus, and then sent via neuroendocrine projections to the posterior pituitary. From there they are released them into the bloodstream. Oxytocin has roles in facilitating childbirth and lactation, but is also thought to promote social bonding and compassion. Vasopressin, also known as antidiuretic hormone, is primarily involved in controlling urine output and regulating blood pressure. The pituitary gland is less than a centimeter in diameter, but it secretes hormones that have widespread effects on behavior and bodily function. Thus, despite its diminutive size it has justifiably earned the moniker of "master gland." Amar AP, Weiss MH. Pituitary anatomy and physiology. Neurosurg Clin N Am. 2003 Jan;14(1):11-23.